Workers place the stones on the culvert façade back to their original positions. The stones were first placed on the structure by hand by the Civilian Conservation Corps. Often, when the infrastructure deficit is mentioned, what comes to mind immediately is roads and bridges built in the 1960s or under the Eisenhower administration's efforts to establish the Interstate Highway System. 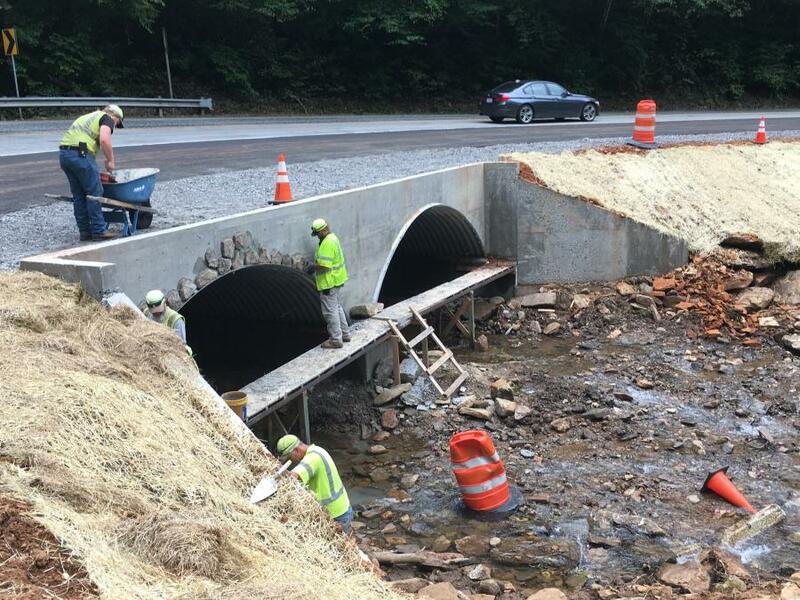 In the case of one $160,000 project, however, the Georgia Department of Transportation's Northeast District took on the challenge of repairing deteriorating culverts in mountainous area of White County on State Route 17 — near Andrew's Cove camp ground, north of Helen — that were built in 1930s by the Civilian Conservation Corps, the work relief program initiated by President Franklin Delano Roosevelt during the Great Depression. By doing the work in house, the DOT saved nearly $1.84 million. "Maintenance took on the challenge," said Katie Strickland, GDOT District 1 communications specialist. "These culverts were more than 60 years old, and the façade of stones were placed by hand by the Civilian Conservation Corps. "We developed a work plan internally and tapped into our maintenance/bridge concrete crew resources to complete this work. We demonstrated that without a contractor, we could rise to the occasion on a historical culvert repair." GDOT crews began the work on July 23 and completed it Nov. 1. 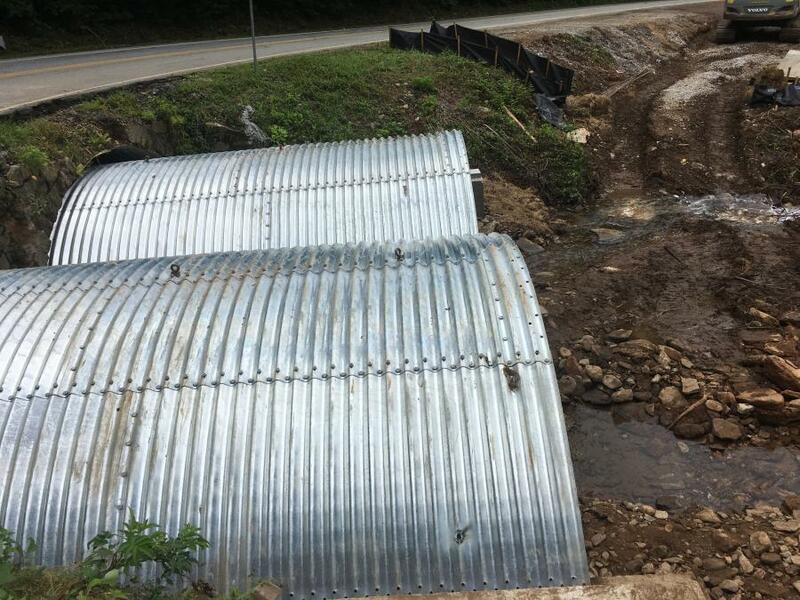 The culverts were located on sharp curve close to where SR 17, which is one lane in each direction, links with SR 75. In addition to extending the culvert, a 20-ft. shoulder was added. The structure, a recognized historic site, required the stones on the façade to be carefully removed and placed back into their original positions. "These structures were deteriorating," said Darrell White, GDOT's District 1 bridge maintenance manager. "It was becoming a real safety concern. The deterioration was quite serious. The head wall was falling apart due to truck traffic getting too close. We have been planning on extending the culvert for a number of years. Our holdup was the historic element and proper procedures had to take place first. "We chose to do the work in house to save money, and yes, we saved quite a bit of money doing so. We built it for $160,000 and contractor wanted $2 million." With the work schedule planned, it was all a question of following the steps. "We labeled each stone that we could save and took pictures so that we could put them back on the new headwall," said White. "The metal arch culvert has a lifespan of 50 years. We picked out mountain stone, so it would match well." Traffic management on the road, which carries 1,000 vehicles per day, involved single-lane closures between 8 a.m. and 5 p.m., complete with signage warning people to slow down. This was bolstered by flagging operators. The first step for the construction was the removal of the stones, which took about two days, with the stones stored on-site after being inspected and cleaned. "We then dug the footings and poured them," said White. "We had to put the arch together and then we set them on the footings and fastened them down. Afterwards we made a headwall to reset the rock." 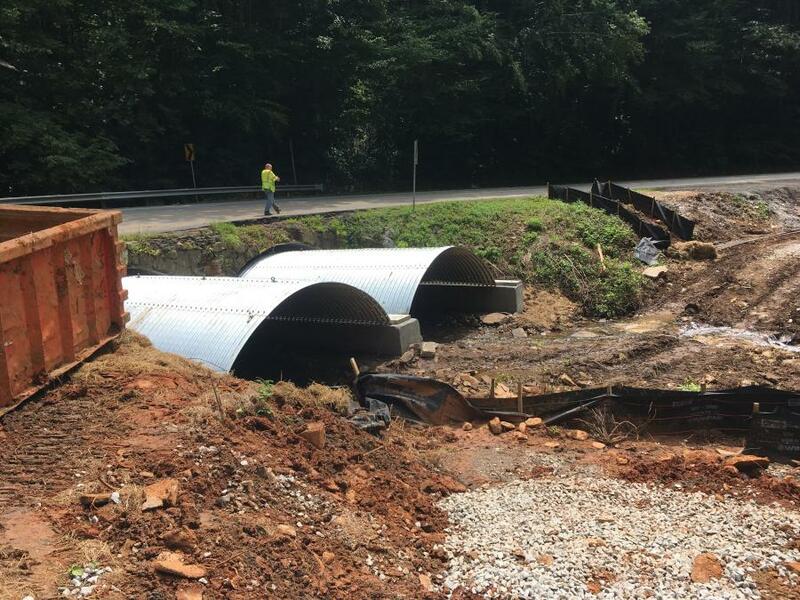 The second step was to repair the culvert and replace what could not be saved, an operation that started on Aug. 15 and was completed on Oct. 15. "Laying the rock went very well," said White. "We used the pictures to make sure we put them in the right place, and we used a dark grout to make it look like the old one." Crews worked on the new shoulder as the culvert aspect was taking place. "The grading crew made the shoulder wider and back filled the culvert," said White. "The asphalt crew came in and paved the shoulder." Following construction, GDOT landscaping crews replaced grass and vegetation that had been damaged. On this project, which involved 10 GDOT staffers, White was assisted by Dexter Worley, who served as foreman; Jody Norton, who was in charge of grading; Rodney Gilreath, who was in charge of paving; and Blake Jennings, who was responsible for erosion issues. GDOT used equipment from its own fleet, as well as rentals, including a Link-Belt 261 trackhoe and a Volvo 0255 trackhoe.